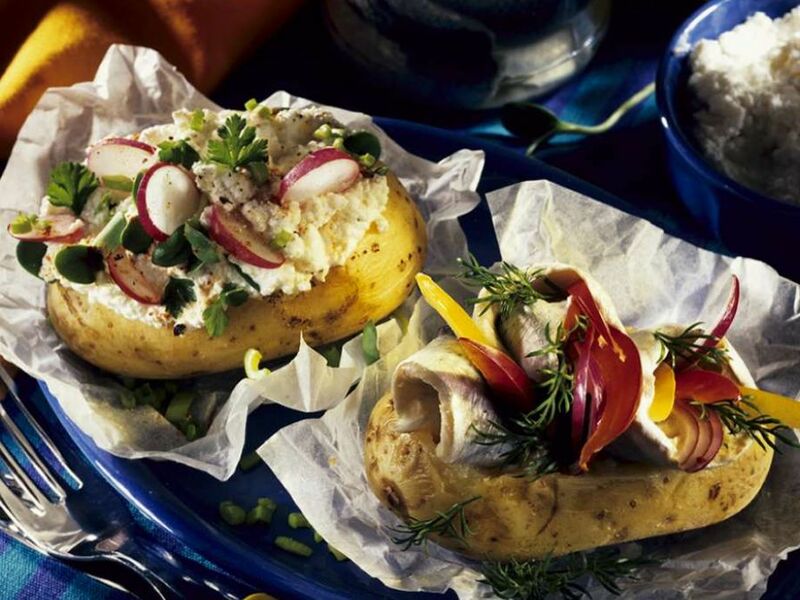 1 Rinse potatoes thoroughly, pat dry, wrap tightly in foil, and prick several times with a fork. Bake in an oven preheated to 170°C (approximately 350°F), about 50 minutes. Mix chives and parsley with cottage cheese and season with salt, pepper and paprika. Rinse, trim and slice radishes. 2 Rinse and halve peppers, remove seeds and ribs and cut into strips. Peel onion and cut into rings. 3 To serve, unwrap potatoes slightly and slit lengthwise. Top 4 of the potatoes with herbed cheese and garnish with radish slices and a few sprigs of watercress. 4 Top remaining 4 potatoes with pickled herring, peppers, and onion rings. Garnish with dill.